ALL NATURAL – Solgar Brewer’s Yeast Powder is an all-natural Brewer’s Yeast (Saccharomyces cerevisiae) which is a great source of amino acids, B-Complex Vitamins (B1, B2 & Niacin) as well as other minerals. Premium powder that is unfortified, unflavored, unsweetened and naturally delicious. BENEFITS – Brewer’s Yeast supports healthy digestion as well cardiovascular health. It is also used to help promote healthy weight as well as supports lactation in nursing mothers. SUITABLE FOR VEGETARIANS – Powder is vegan, non-GMO and is free of Soy, artificial flavors, sweeteners, dairy, preservatives and colors. HOW IT’S MADE – Unlike most Brewer’s yeast which is derived from the fermentation of beer with the addition of hops which can impart a bitter taste and odor, Solgar Brewer’s Yeast is produced from beet molasses under carefully controlled conditions. After the fermentation process, the yeast is collected and dried using special techniques to preserve the yeast’s vitamin, protein and mineral content. 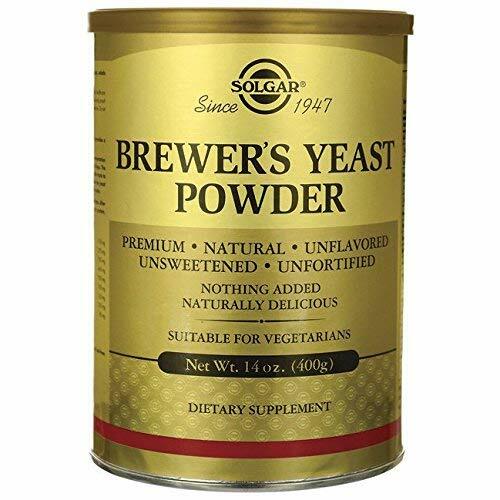 Solgar – Brewer’s Yeast Powder 14 oz Supports Heart & Digestive Health A completely natural primary Brewer’s Yeast (Saccharomyces cerevisiae) that provides a source of amino acids, B-complex vitamins and minerals. SOURCE: Most Brewer’s Yeasts are derived from the fermentation of beer Such fermentation involves using grain (such as rice or wheat) malt, active yeast and the dried flowers of hops. The addition of hops to the fermentation gives a characteristic flavor to beer but imparts a bitter taste to the dried Brewer’s Yeast obtained as a byproduct. Although efforts are made to debitter the yeast prior to final drying operations, most Brewer’s Yeasts are, nevertheless, left with a bitter odor. Solgar Brewer’s Yeast is produced from beet molasses under carefully controlled conditions. After fermentation, the yeast is collected and dried using special techniques to preserve its protein, vitamin and mineral content. This statement has not been evaluated by the Food and Drug Administration. This product is not intended to diagnose, treat, cure or prevent any disease.